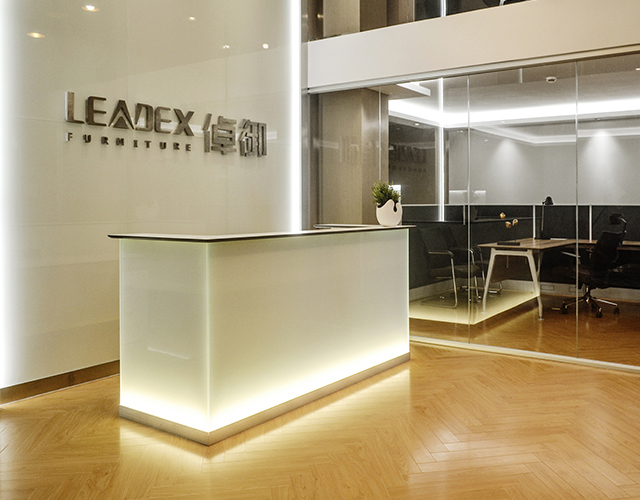 Leadex office center - PROJECT - FOSHAN LEADEX FURNITURE CO.,LTD. With your supports, we will push forward to offer the best office furnitures in the world! 2. what we really want? Leadex office furniture is a company strive for quality clients and growing companies with high quality office furniture and perfect commercial space. We have the spirit to provide customers with high quality and efficient office environment, uphold the faith in a better buying experience for users, determined to stage China Office furniture to a higher level. Our team is young, passion and competitive. So we agreed that selecting simple, modern office furniture will match more our team spirit. This sales experience center in the first place is that we want a place to showcase our latest products. We do hope to attract the best sales talent, design talent through the beautiful Office environment. Customers can also obtain a good experience in our real office. Our products can update continually through customers, sales, designers interaction. First we have to understand our team composition, then divide into work areas. Leadex team includes Senior Management, Sales Department, Research and Development Department, Production department, Finance Department. According to the properties of each small team, we will invent a tailor-made working environment for them. AFTER THE SPACE LAYOUT, WE CAN START TO SELECTED FURNITURE FOR EACH TEAM. All Office areas use high partitions to divide into different departments. Transparent glass and wood panels, can keep the surrounding transparent in a open tone .Meanwhile we take into account the different levels of privacy requirements, then keep the balance between openness and privacy. Contrast to traditional gypsum walls, Modular high partition is more abundant and more flexible in material and color choosing, which can also reduce pollution. Pure white reception area, under the streaks of light, is so simple, peaceful, full of modern. We creat a relatively closed space by screens. thinking and communication with visitors. Here we use thin-wide partitions combination. Thick partition as spine is for wires running. design,and save the general cost. Design area should keep off external disturbance,while encourage internal communication. Here we creat an individual space by high partitions. Inside we give open desking system. We also provide leisure chairs for brain storming. Due to their workstyle, we have to configure the H1650mm screens, enhanced privacy within the working group. We provide everyworking group overhead cupboards and shelves,which can increase vertical storage space. in the back unit, all revealed on the quality of design and relentless pursuit. with decorative, seamless throughout the space. In order to encourage the exchanges between teams, in this space, we do our best to eliminate the cold sense of industrial products, creating a warm and harmonious atmosphere. So we use warm woodgrain for the table and wall unit. The unique warm feeling from the leather in the chair makes the whole space soft. coffee. Regardless of host and guest，we all enjoy the chit-chatting.